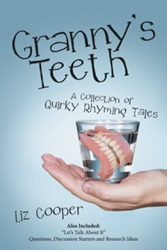 Drawing upon her experience as a former teacher and school system reading supervisor, Liz Cooper wrote the short story collection, “Granny’s Teeth: A Collection of Quirky Rhyming Tales” (published by Archway Publishing), about “ordinary kids on extraordinary adventures” intended to make readers laugh and practice critical thinking skills. Liz Cooper grew up in Garden City, New York. She earned a Bachelor of Science in nursing from Catholic University in Washington, D.C. After switching careers and becoming an elementary school teacher, Cooper earned a master’s in reading from Towson University. She retired from the school system as reading supervisor after 19 years with the St. Mary’s Public School System in Maryland. Along the way, Cooper found time to open two specialty toy and children’s book stores, invent a patented knitting needle product and become a Maryland registered and national board-certified polysomnography – sleep – technician. She resides in Maryland with her husband.